A basal-bolus regimen requires injecting insulin multiple times a day and requires two types of insulin (one insulin for fasting control and another for mealtime control). Multiple daily injections (MDI) can interfere with daily living, increase injection discomfort and increase anxiety when injecting in public.5-7 Unfortunately, evidence supports more than half of patients prescribed MDI report missing injections, with 20% reporting they miss injections on a regular basis.7 Non-adherence to prescribed regimens can negatively impact efficacy. In more than 27,000 patients prescribed insulin, combined analyses of medical and pharmacy administrative claims demonstrate that nearly 80% of patients had an A1C measurement above 7.0%.8 These data reflect the less-than-optimal situations that face typical clinicians in real-world practice and suggest a sizable population exists with unmet therapeutic needs. The use of a novel insulin delivery option may address treatment challenges and improve patient outcomes. V-Go Disposable Insulin Delivery device (Valeritas, Inc., Bridgewater, N.J.) is a wearable device that delivers a continuous basal rate of insulin, as well as on-demand mealtime dosing. V-Go is available in basal rates of 20, 30 or 40 units/24 hours with all providing up to an additional 36 units of insulin for mealtime bolus dosing in two unit increments. V-Go is filled with U-100 fast-acting insulin, affixed to the skin and worn for a full 24 hours. The push of a button inserts a 4.6 mm 30 gauge stainless steel needle subcutaneously, which initiates delivery of the continuous preset basal rate of insulin. Patients can self-administer mealtime bolus doses by pressing the bolus ready button and the bolus delivery button through their clothing for discreet insulin administration. 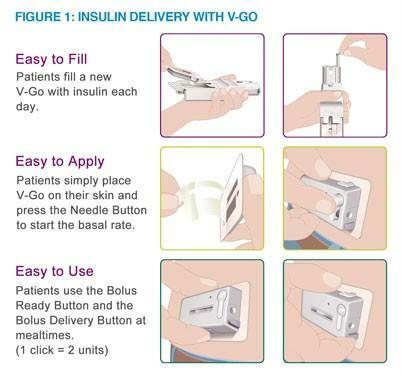 V-Go uses a hypoallergenic and latex-free adhesive to adhere to the skin and is designed to be removed and replaced after wearing for 24 hours.9 The steps to fill, apply and administer insulin with V-Go are shown in Figure 1. This article examines real-world clinical results in patients with uncontrolled Type 2 diabetes who switched from conventional insulin administration to insulin delivery by V-Go. Clinical insight and practical application for V-Go also are provided. A retrospective review was conducted of the electronic medical record (EMR) database for Diabetes America, which includes multiple specialized diabetes centers across Texas. Patients with uncontrolled Type 2 diabetes using pen(s) and/or syringe(s) to administer basal or basal-bolus insulin injections and had switched to V-Go were included. At baseline, all patients were ≥ 21 years of age with an A1C between 7% and 14%. Inclusion for this analysis required two A1C measurements post V-Go initiation with at least one A1C measurement on V-Go. V-Go education and initiation were provided by a diabetes educator or a member of the health-care team. Additional supportive written materials as well as access to a 24-hour customer care center were provided by the manufacturer. The primary endpoint was change in A1C from baseline. Secondary endpoints included change in insulin dose, body weight and patient-reported hypoglycemic events. Descriptive analysis (mean, percentage, standard deviation) were performed for all baseline characteristics. Repeated measure t-tests were used to assess changes in A1C, insulin and weight from baseline for all patients with two follow-up A1C measurements on V-Go and based on stratification by baseline regimen (basal-only or basal-bolus). Significance was set at p<0.05. The study protocol was reviewed and approved by Allendale investigational review board, and a waiver of informed consent was approved. Clinical results based on V-Go therapy were collected through August 30, 2015, for inclusion in the current analysis. This evaluation included 146 patients diagnosed with Type 2 diabetes administering insulin prior to V-Go initiation. Of the 146 patients, 117 patients (80%) had two recorded follow-up A1C measurements on V-Go and will serve as the analysis population; 21% of the patients had discontinued V-Go between the first and second follow-up A1C measurements. Table 1 shows patient baseline characteristics. The mean duration from the start of V-Go to the first A1C measurement was 3.1 months, and the mean duration to the second A1C measurement was 6.7 months. Results, therefore, will be presented as three-month and seven-month visits. Significant changes in A1C were observed for all patients regardless of baseline regimen when switched to V-Go (Figure 2). At baseline, mean ± SD A1C was 9.38 ± 1.45%, which was reduced to 7.86 ± 1.14% at three months and to 7.82 ± 1.20% at seven months. Patients administering basal-only regimens when switched to V-Go had greater reductions than those previously administering basal-bolus regimens. 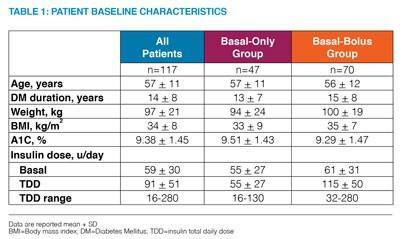 Figure 2 shows insulin total daily dose at baseline compared to doses delivered with V-Go. The mean insulin total daily dose (TDD) used to initiate V-Go was 56 units/day with a basal/bolus ratio of 58%/42%. Across the patient population, mean insulin TDD at seven months was reduced by 35% (-32 ± 47 units/day, P<0.0001) from baseline. Patients prescribed basal-bolus regimens prior to the switch to V-Go benefitted from the greatest mean reduction in TDD (-53 ± 47 units/day, P<0.0001), while patients administering basal-only insulin regimens benefited from insulin redistribution to include prandial insulin for mealtime coverage. Nearly 40% of the patients were prescribed a TDD ≥ 100 units at baseline, yet only 9% of the total patient population was prescribed a supplemental injection of insulin in addition to the V-Go dose. By three months, mean weight increased (1.5 ± 3.0 kg; P<0.0001) across the patient population, but remained stable by the second follow up. At baseline, 20% of patients reported hypoglycemia while administering their prescribed insulin regimen; after seven months of V-Go use, 19% of patients reported hypoglycemia based on medical records. One case of severe hypoglycemia was reported but did not require third-party assistance. Oral medications were adjusted, and the patient continued to use V-Go. Of the 146 subjects evaluated, 29 discontinued use of V-Go by the second A1C measurement with the primary reasons being cost/insurance coverage (N=10), skin irritation (N=8) and transition to an insulin pump (N=5). With the decline of beta cell health, insulin therapy often becomes the cornerstone of diabetes treatment to maintain or achieve acceptable glucose control. Insulin is the most consistently effective and potent way to improve blood glucose control.10,11 Establishing an understanding of why persistent hyperglycemia exists when moderate to high doses of insulin are prescribed is essential to improving care. Evaluating whether the prescribed insulin regimen provides adequate coverage to match glycemic fluctuations is an essential first step because insulin secretion from the pancreas is limited with disease progression. Secondly, the assessment of insulin adherence can provide valuable insight because prescribed insulin doses often are not reflective of the actual dose being administered or even required by the patient. When basal-only insulin regimens fail to achieve glycemic targets, current guidelines support the use of basal-bolus insulin regimens delivered by MDI in patients with Type 2 diabetes.12 Patients prescribed basal-only regimens may be reluctant to add prandial insulin due to the necessity to plan insulin injections around daily activities and the complexity of multiple injections, which can lead to non-adherence. Mealtime injections often are missed or skipped, and many patients fall asleep prior to administering their bedtime injection. These omissions can lead to consequential gaps in insulin coverage, greatly impacting glycemic control. Decreasing the complexity of basal-bolus therapy and offering a discreet and convenient manner in which to deliver insulin may improve insulin acceptance and adherence, leading to improved efficacy. In this study, we examined the outcomes of 117 patients after switching from insulin injections via pen and/or syringe to insulin delivery with V-Go. Following the switch to V-Go, glycemic control improved with significantly less insulin. Patient-reported hypoglycemia with V-Go was similar to baseline. The change in weight seen across the patient population was well within what is expected with insulin therapy, and although the change was statistically significant, it was not clinically relevant. A common V-Go misperception is that the maximum total dose (76 units/day) for patients with Type 2 diabetes is not sufficient. The findings in this study suggest otherwise because greater than 90% of patients (N=107) were able to meet prescribed insulin needs with V-Go, which is impressive considering 52 of the 107 patients were prescribed baseline doses in excess of 76 units/day. We agree V-Go may not meet the needs of all patients requiring insulin; however, as evident in this study, V-Go adequately met the prescribed insulin needs for the majority of patients. There are limitations in this analysis. Primarily, the study was retrospective in nature and did not include a parallel control group. Data reflect real-world diabetes management, and frequency of patient contact, insulin titration and strict adherence measures were not enforced. Greater reductions in A1C may have been possible with additional patient contact and insulin titration. Analyses of insulin requirements relied on the prescribed doses recorded in the medical charts; actual insulin dosing may have differed. Hypoglycemia history was based on data recorded in the medical records and was self-reported by patients. Additional disposable insulin delivery devices designed for patients with Type 2 diabetes are in development and expected in the near future. Advancements in insulin therapy have proven beneficial over the years. Insulin pens now are preferred over syringes based on convenience and eliminating the need to draw up insulin, resulting in improved compliance.17 In our opinion, novel insulin delivery devices provide additional benefits over insulin pens when basal-bolus therapy is necessary and can further improve adherence, which ultimately can impact efficacy. Our study supports the effectiveness of switching to V-Go for insulin delivery in patients with Type 2 diabetes. With the use of V-Go, patients demonstrated significant glycemic improvement at three months, which was sustainable through seven months. In addition to improved A1C measurements, V-Go dosing was sufficient to meet the prescribed insulin needs of over 90% of patients, and total daily insulin requirements were significantly reduced when switched to V-Go. 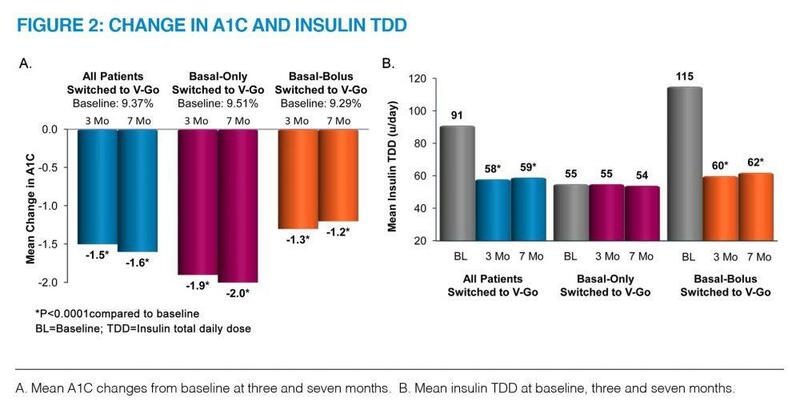 Patients administering basal-only insulin regimens prior to V-Go demonstrated the greatest improvements to A1C, while patients previously administering basal-bolus insulin regimens benefited from the greatest reduction in TDD. Insulin delivery with V-Go requires only one injection per 24 hours and provides a simple, discreet and convenient way to deliver basal-bolus therapy, which may enhance patient compliance and optimize glycemic control. • V-Go is a wearable insulin delivery device appropriate for adult patients who need prandial insulin. • V-Go delivers a continuous preset basal rate of insulin plus on-demand bolus dosing at mealtimes with just one daily application, one insulin and clicks. • V-Go significantly lowers A1C with less insulin and without adding injections. • V-Go provides a simple, discreet and convenient method to deliver insulin. • V-Go has been proven safe and well accepted by patients. No funding or study product was provided to the study site, study participants or study investigators. Valeritas, Inc., Bridgewater, N.J., provided funding for the review of the protocol by the investigational review board. The authors thank Donna Doherty, MS, RD, LD, CDE, BC-ADM, for assistance in data collection and study conduct. Disclosures: Rosemarie Lajara has received speaker or consulting honorariums from Valeritas, Novo Nordisk, Astra Zeneca, Boehringer Ingelheim and Takeda. Carla Nikkel currently is employed by and is a shareholder of Valeritas, Inc.
1. Riddle MC, Rosenstock J, Gerich J, et al. The treat-to-target trial: randomized addition of glargine or human NPH insulin to oral therapy of type 2 diabetic patients. Diabetes Care. 2003;26:3080–86. 2. Hermansen K, Davies M, Derezinski T, Martinez Ravn G, Clauson P, Home P. A 26-week, randomized, parallel, treat-to-target trial comparing insulin detemir with NPH insulin as add-on therapy to oral glucose-lowering drugs in insulin-naive people with type 2 diabetes. Diabetes Care. 2006 Jun;29(6):1269-74. Erratum in: Diabetes Care. 2007 Apr;30(4):1035. 3. Holman RR, Thorne KI, Farmer AJ, Davies MJ, Keenan JF, Paul S, Levy JC; 4-T Study Group. Addition of biphasic, prandial, or basal insulin to oral therapy in type 2 diabetes. N Engl J Med. 2007 Oct 25;357(17):1716-30. Epub 2007 Sep 21. 4. Holman RR, Farmer AJ, Davies MJ et al. Three-year efficacy of complex insulin regimens in type 2 diabetes. N Engl J Med. 2009; 361: 1736–1747. 5. García-Pérez LE, Álvarez M, Dilla T, Gil-Guillén V, Orozco-Beltrán D. Adherence to Therapies in Patients with Type 2 Diabetes. Diabetes Ther. 2013;4:175–194. 6. Peyrot M, Rubin RR, Kruger DF, Travis LB. Correlates of Insulin Injection Omission. Diabetes Care. 2010;33:240–245. 7. Peyrot M, Barnett AH, Meneghini LF, Schumm-Draeger PM. Factors associated with injection omission/non-adherence in the Global Attitudes of Patients and Physicians in Insulin Therapy study. Diabetes, Obes Metab. 2012;14:1081. 8. Grabner M, Chen Y, Nguyen M, Abbott SD, Quimbo R. Using observational data to inform the design of a prospective effectiveness study for a novel insulin delivery device. Clinicoecon Outcomes Res. 2013 Sep 23;5:471-9. 9. Valeritas, Inc.V-Go Instructions for Patient Use. ART-037 Rev: H 09/2011. Available online at: http://www.go-vgo.com/sites/default/files/upload/instructions-for-patient-use.pdf. 10. Owens DR. Stepwise intensification of insulin therapy in Type 2 diabetes management— exploring the concept of the basal-plus approach in clinical practice. Diabet Med. 2013;30:276-288. 11. Nathan DM, Buse JB, Davidson MB, et al. Medical management of hyperglycemia in type 2 diabetes: a consensus algorithm for the initiation and adjustment of therapy: a consensus statement of the American Diabetes Association and the European Association for the Study of Diabetes. Diabetes Care. 2009; 32(1). 12. Handelsman Y, Bloomgarden ZT, Grunberger G, et al. American Association of Clinical Endocrinologists and American College of Endocrinology – clinical practice guidelines for developing a diabetes mellitus comprehensive care plan—2015. Endocr Pract. 2015;21(1). 13. Rosenfeld CR, Bohannon NJ, Bode B, et al. The V-Go insulin delivery device used in clinical practice: Patient perception and retrospective analysis of glycemic control. Endocr Pract. 2012;18(5):660-665. 14. Sandberg, M, Martinez, J. 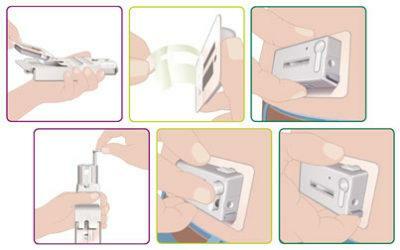 The V-Go, a Simple Disposable Insulin Delivery Device for Type 2 Diabetes. Practical Diabetology. 2013;32(3):6–22. 15. Lajara R, Fetchick DA, Morris TL, Nikkel C. Use of V-Go Insulin Delivery Device in Patients with Sub-optimally Controlled Diabetes Mellitus: A Retrospective Analysis from a Large Specialized Diabetes System. Diabetes Ther. 2015;6(4):531-545. 16. Lajara R, Davidson JA, Nikkel C, Morris TL. Clinical and Cost Effectiveness of Insulin Delivery with V-Go Disposable Insulin Delivery Device versus Multiple Daily Injections in Patients with Type 2 Diabetes Inadequately Controlled on Basal Insulin. Endocr Pract. 2016 June; 22(6):726-735. 17. Lee WC, Balu S, Cobden D, Joshi AV, Pashos CL. Medication adherence and the associated health-economic impact among patients with type 2 diabetes mellitus converting to insulin pen therapy: an analysis of third-party managed care claims data. Clin Ther. 2006 Oct;28(10):1712-25; discussion 1710-1. Erratum in: Clin Ther. 2006 Nov;28(11):1968-9.